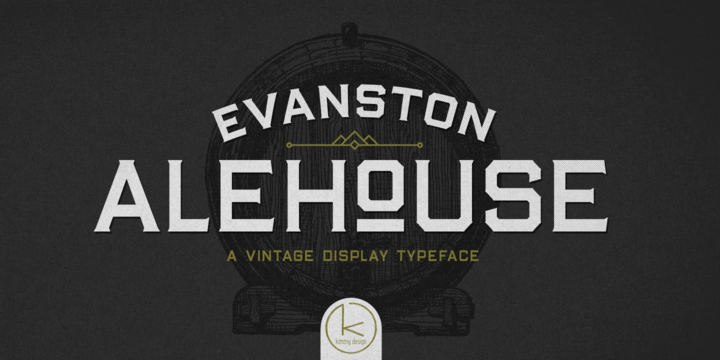 Evanston Alehouse is a vintage typeface created by Kimmy Kirkwood and published by Kimmy Design which was inspired by the American prohibition period. This big family pack is available in 25 fonts, 2 Postions (Regular & Round), 4 weights (Condensed, Narrow, Wide, Expanded) each with 3 weights (Light, Madium, Black), 3 Heights (Capitals, lowercase, small caps), alternatives and an ornament. It is perfect for display use, logo, poster, headline, title etc. Enjoy! Price: starting from $10,00 for one font to $99,00 for all 25 fonts. A font description published on Monday, April 2nd, 2018 in Fonts, Kimmy Design, Kimmy Kirkwood by Alexandra that has 1,840 views.